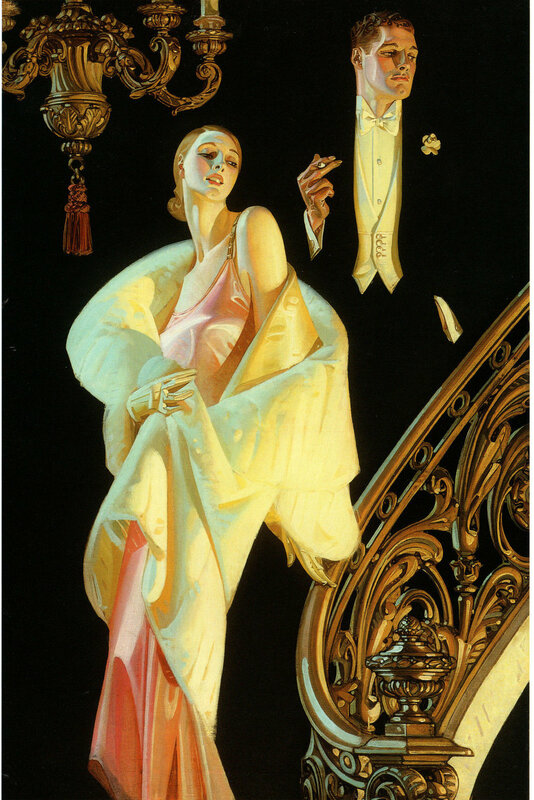 In December of 1950, Saturday Evening Post cover artist J.C. Leyendecker outlined his basic method in a letter to a student. “My first step is to fill a sketch pad with a number of small rough sketches about two by three inches, keeping them on one sheet so you can compare them at a glance. “Select the one that seems to tell the story most clearly and has an interesting design. Enlarge this by square to the size of the magazine cover, adding more detail and color as needed. “You are now ready for the model. First make a number of pencil or charcoal studies. Select the most promising and on a sketch canvas do these in full color, oil or water with plenty of detail. Keep an open mind and be alert to capture any movement or pose that may improve your original idea. “You may now dismiss your model, but be sure you have all the material needed with separate studies of parts to choose from, for you are now on your own and must work entirely from your studies. “This canvas will somewhat resemble a picture puzzle, and it is up to you to assemble it and fit it into your design at the same time simplify wherever possible by eliminating all unessentials. All this is done on tracing paper and retraced on the final canvas. “As a rule, I start work with a round or flat sable using a thin wash, with turps as a medium. Keep shadows very transparent, and as the work progresses, apply the paint more thickly on lighted areas, adding some poppy oil or linseed oil if necessary, and using a larger flat bristle brush for the heavier paint, but still keeping the shadows thin and vibrant. “Your finished painting may be any size to suit you, but is usually about twice the size of the reproduction. “When the work is dry, apply a quick drying retouching varnish either with a brush or an atomizer. “Sometimes because of prohibitive model rates or other reasons, one is forced to use photography, but try and avoid it if possible.